The one constant in an ever changing world is our annual Kansas bowhunt with Cimarron River Outfitters owned by my good friends Kent Jarnagin and Kent Wolfolk of Protection Kansas. This year is special in that it is entirely a Bowsite.com bowhunt. 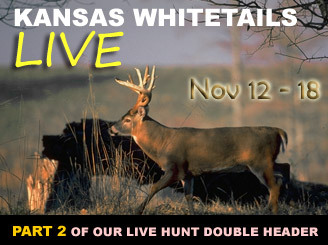 Ron Baxley from Arkansas (Tater) who has been featured on several previous Live Hunts will be hunting here again along with Jake Ensign from New York (Medicineman). Jake is the guy who brought you his live polar bear hunts from the ice and shot all 4 sheep in the same year. This will be a fun group this year as we try to see how much bone we can put on the ground. Being that last year I was completely skunked (twice) as I focused on a 180" typical, I am highly motivated to kill any big buck although I'm sure I'll make the same stupid mistake again this year. Jake has never killed a PY buck which is odd for a man who has his sheep slam and a polar bear but he certainly came to the right place. As usual, we are hunting both baited and unbaited areas from treestands and ground blinds under strictly fair chase conditions on private land owned by the outfitters. I plan on providing reports for both Ron and Jake each day as well. Pat: Kent took me to the Calvary creek stand which is in a different location now than in previous years. I had several deer come in when it was dark. One of them was big but it was too early to see a rack. As he headed away he caught my wind and blew. 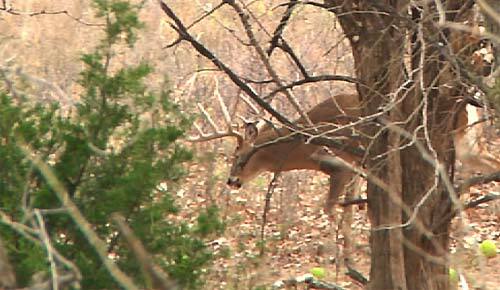 It was one of those deep, low blows that typically come from a bigger buck. But I never could see him. Another 30 minutes later and another buck came in, but this one I could see. He was not a shooter but may be in a year or too. A nice 9 pt with great beam length. The wind kicked up and by the time I left the stand at 11 AM the wind gusts were pushing 30mph and stayed that way through throughout the day. Jake: Jake hunted Ken't tree belt this morning. He saw a 5pt and a 9pt with a 17" spread. He was not a shooter but very close. 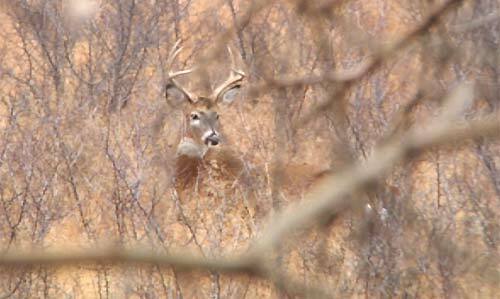 Pat: I hunted a new stand this afternoon which is not far from where I shot my biggest buck several years ago. It was windy as hell but several deer came in behind me. Long before the sun went down I caught a glimpse of a deer at the far side of the tree belt. As I got a better look I said to myself "wow" he was a shooter that looked like a mainframe 10. I never could see his spread clearly but after reviewing the video we are putting this buck in the 160" range. He made 10 scrapes in 80 yards before moving down the tree belt to the east. He never came back again. 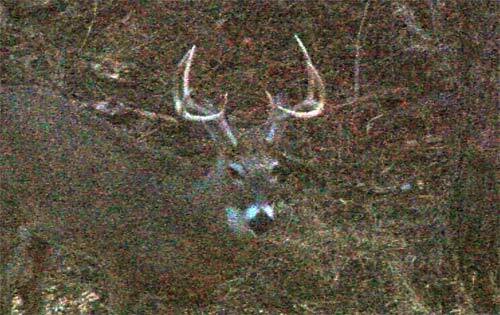 This is a great buck and a shooter all day long. I may focus on him for a couple of days. Another buck showed up behind me but like this morning's buck, he was at least a year or two away from consideration. A pretty buck for sure. Today was a great day. I saw lots of bucks and lots of pre-rut behaviors. Looks like we're going to have a great week. I left all of my gear in the tree and will be right back here in the AM. I may just focus on this buck for a couple of days. Jake: Jake hunted the wooden stand where Ron had killed that big 10 two years ago while I filmed it. Jake saw a huge 8 from here that he would have shot if he came in. He was heading in but a little buck ran off a doe and the big boy chased him out into the fields behind him. Ron: Ron showed up just in time to hunt the the big maple tree where Bill Gaunt shot his big buck two years ago but it was slow at that location - Just does and fawns. Congratulations to Aaron Kotalik from South Dakota for being the first person to correctly pick the exact treestands in our latest treestand challenge game out of 24,000 entries. Aaron Will receive a brand new Summit Falcon, part of Summit's New Raptor Series Hang on Treestand line. Even though it's over you can still Play the Game Here! 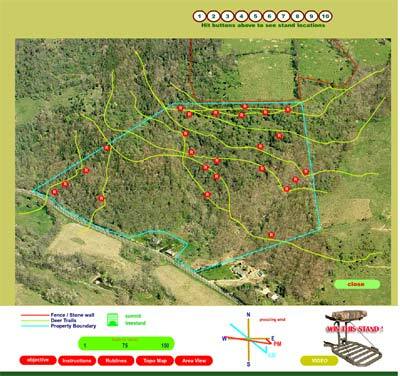 AM: Stand 4 - wind patterns make the deer feel comfortable as they come back from feeding in the fields to the E and NE. They are also funneled by the fence line and stone wall. The prevailing wind and topography keeps the deer from winding you here on most mornings. PM: Stand 2 - the deer reverse the direction and hit the corner of that fence and stone wall as they head from bedding cover to the N and NW. The wind is perfect for that stand. All other stands can produce deer, but none are nearly as consistent as these two stands.